"Anyway, about an hour and 15 minutes in to the flight, I felt a barely discernible roughness, and then a significant cough, and the RPM dropped about 200. I quickly pulled the carb heat out, but then it got even worse. So I pushed the carb heat back in, waited for a minute, and pulled it back out. My engine was still running, but my RPM I am inclined to think that I was experiencing a sticky valve problem. What do you think John? " There are so many possibilities that only a systematic troubleshooting process will reveal the answer. The O-200 normally is rare to stick the exhaust valve since the original guide material was relatively soft aluminum-bronze. 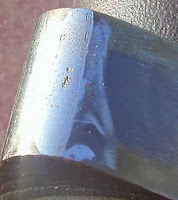 As deposits build-up in the guide, the valve would just wear away the guide. Then Superior had a great idea, use the harder ni-resist guide that the bigger engines have to give better wear - well yes, except now the valve sticks. I'd rather have it wear. It's been so long since I've been in the cylinder repair business that I don't know who is using what guide. Do not fly if you suspect a stuck valve. If the valve sticks closed and doesn't open in 1/2 propeller revolution the rocker arm supports will blow-off leading to total loss of engine power. Even if that doesn't happen, with each revolution the high opening forces are smashing your camshaft lobe flat. This is why I do not recommend Marvel Mystery Oil and other solvents to fix a sticky valve - yes they might unstick it in time but while it's doing it's work you risk expensive and dangerous engine damage. Also, the root cause of valve sticking is not corrected. A O-200 engine should not stick valves - if it does then something is wrong with the engine (could be the shape of the exhaust port). Camshaft lobe damage. Trying to push open a sticky valve smashes the camshaft lobe ($$$).